The NBA has announced that Houston Rockets’ James Harden has been fined $25,000 for publicly criticizing the officiating following their loss to the Lakers last Thursday night. Harden made his comments to the media following the Rockets’ 111-106 loss to the Los Angeles Lakers on Feb. 21 at Staples Center. 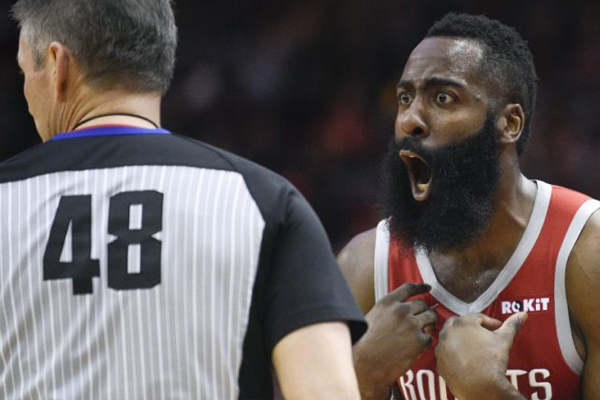 His comments were aimed at referee Scott Foster, who he believes has a “personal” issue with the Rockets and should not be allowed to officiate any more of their games. “Scott Foster, man. I never really talk about officiating or anything like that, but just rude and arrogant,” Harden said. “I mean, you aren’t able to talk to him throughout the course of the game, and it’s like, how do you build that relationship with officials? And it’s not even that call [on the sixth foul]. It’s just who he is on that floor. The Rockets and Harden are not the only team to have frustrations with Foster, he has a reputation around the league for a short fuse that doesn’t let you question calls. As for Harden, he did not play in the Rockets’ 118-112 win against the Golden State Warriors on Saturday as he was dealing with flu-like symptoms as well as a cervical strain in his neck.